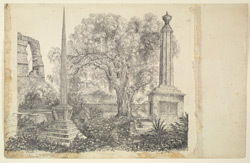 Pencil and ink drawing showing graves and memorials in the cemetery at Asirgarh, Madhya Pradesh by Sir James Abbott (1807-1896). On the reverse of this drawing is a landscape with a lake and trees. James Abbott married Margaret Anne Harriett Fergusson, eldest daughter of John Hutchinson Fergusson of Trochraighe, Ayr, in Calcutta on 8 February, 1843. She died 11 February 1844 at Asirgarh, following the birth of her daughter, Margaret, the previous day. A photolithograph which accompanied these drawings, shows the column was later replaced by a marble tomb.